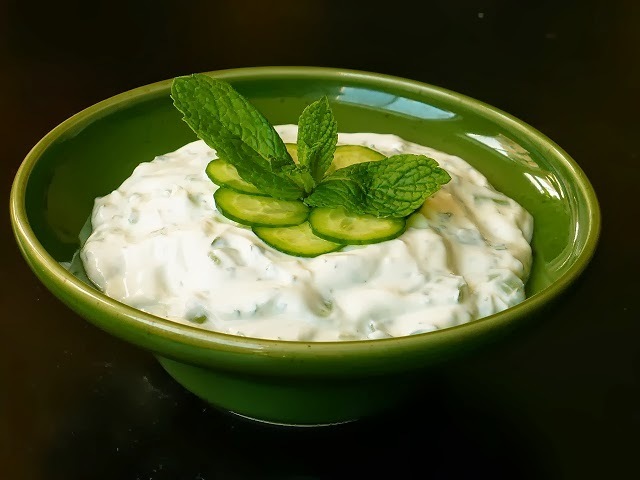 Tzatziki is a widely used dip for appetizers or side dishes. Its flavors are especially enhanced when served with the mild taste of crisp vegetables, such as the fried zucchini and eggplants in recipe above. In Greece, these bite-size vegetables and dip are often served with ouzo or cold beer. 1. Peel, deseed and coarsely grate the cucumber. Set aside on paper towels to absorb excess moisture. 2. Stir yoghurt until smooth and creamy. While stirring, gradually mix in the olive oil and vinegar. 3. Crush the garlic cloves in a garlic press then add into the yoghurt mixture. Stir in cucumber and dill and season to taste with salt and pepper. Garnish with a dash of extra-virgin olive oil, fresh whole dill leaves and a few kalamata olives. Tzatsiki can keep for a few days when refrigerated. However, the flavor of the garlic gets increasingly stronger by the day. If Greek Yoghurt is not available, substitute with regular yoghurt, strained in cheesecloth for 2 to 3 hours, in the refrigerator.